Labels, Colour & Style Options for this Product: As per image - purple tintBlueCream/IvoryGoldGreenGreen & Red TintPinkPink & Purple Tinted WrapPurpleRedSilver 133 currently available in stock to buy now. Metallic Party Popper - pop their corks with a mildly explosive bit of fun! Colours may vary. 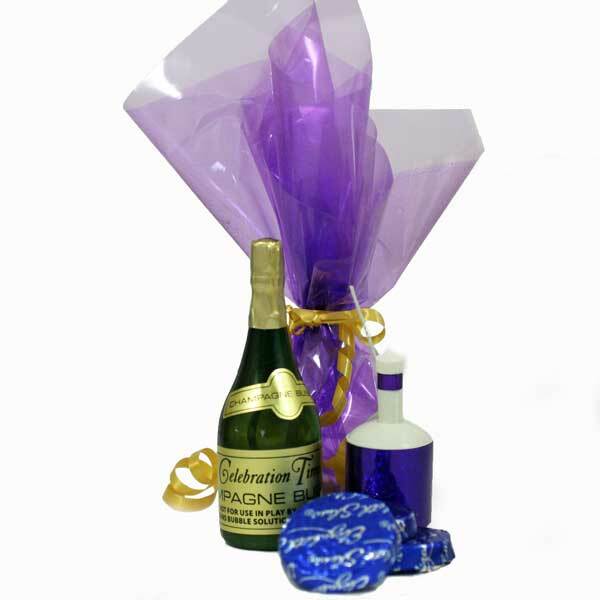 Ours are hand wrapped favours made from fabulous tinted wrap, gathered together and finished with curling ribbon to ensure that this is a wedding favour that will be remembered! You can personalise your party favours with a gift tag with a message of your choice. Simply add to your basket now, and you can select Personalised Gift Tags at only 20p each from the next screen. If you’d like your wedding favours to match your colour scheme, or you’d like us to put something together especially for you, simply click on Create your own Party Bags or call one of the team on 01604 780525 and tell us what you'd like and we’ll do our best to accommodate your requirements! 133 currently available in stock to buy now.